I was happy to participate in the 2018 John Gibbard Award held in Vancouver on Sunday, October 21st. George Somerwill delivering introductory remarks. This annual award is presented by the UN Association in Canada, Vancouver Branch, every year to a young person or organization who has demonstrated a humanitarian approach to projects in Canada or internationally. This year’s winner was Andrew Sheroubi who specializes in Chemical and Biological Engineering. Andrew has already used his humanitarian skills in places as diverse as Uganda and the Caribbean and also persuaded the UBC Engineering Faculty to put together an undergraduate course in Humanitarian Engineering. He was the creator and a facilitator for his own course. The UN Association in Canada is an advocacy organization founded in 1946 to educate Canadians about the goals and ideals of the United Nations. 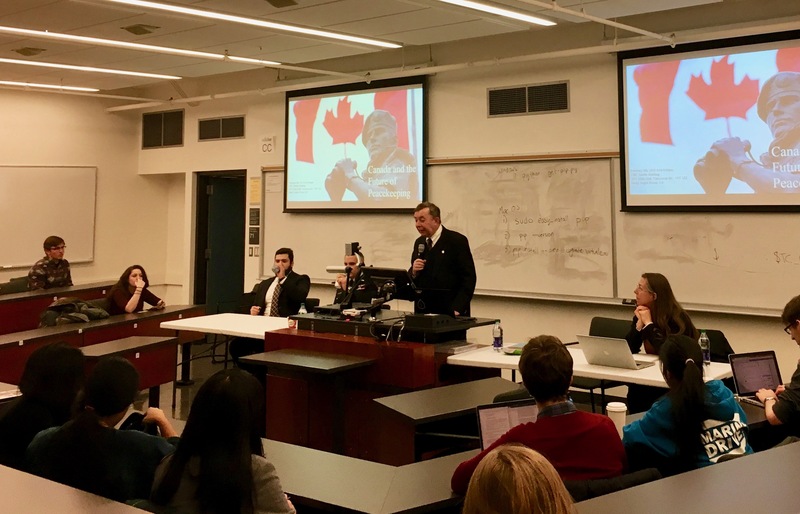 The newly formed AMS Model NATO team at UBC organized a panel on the topic of peacekeeping on Thursday, February 8th. The panelists involved a serving member of the Canadian Armed Forces Reserve Lieutenant-Colonel W. Scott Raesler and UBC International Relations professor Katherina Coleman. As a former Department of Peacekeeping Operations Director of Communications, George was invited as the third panel member where he commented on the current status of Canadian peacekeeping. At the time of the conference (before the latest announcement), George stated that Canada’s contributions seemed to be in retreat. Since 2015, Canada’s role in peacekeeping has been a source of speculation and disappointment. In November of 2017, Canada played host to a defence ministerial conference attended by the Prime Minister, Minister of Foreign Affairs Kristy Freeland and Minister of National Defence Harjit Sajjan. At the conference, Canada and other nations pledged their support for United Nations peacekeeping. Canada will provide 200 technical experts and two transport aircraft but at the time it was unclear where those resources would be used. We have subsequently learned that Canada will participate in the United Nations mission in Mali (MINUSMA). Canada’s new commitment is a good first step. But it is happening from a very low baseline. In February, Canadian peacekeepers on the ground numbered just 43 – the lowest in decades. In moving ahead, the Canadian government is showing an abundance of caution, given Mali’s reputation as a dangerous place for UN peacekeepers. UN for All outreach at Burnaby North Secondary School for the Global Issues Speaker Series in May 2017. 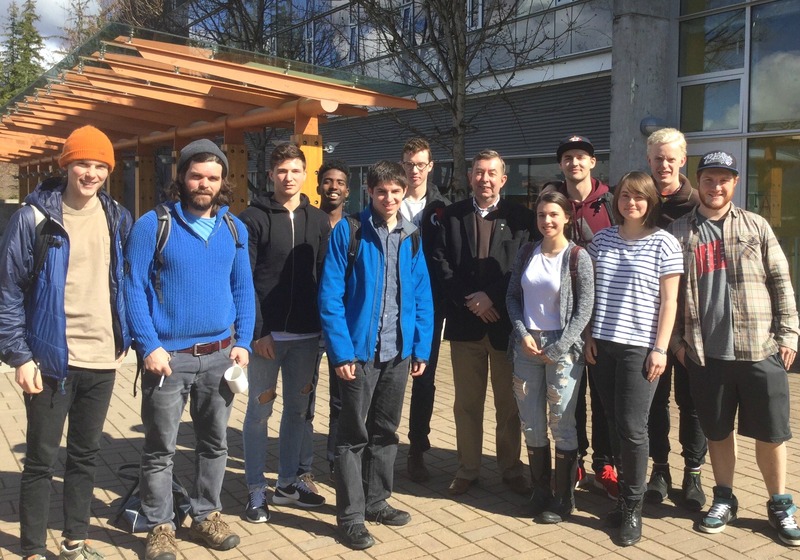 On Friday, March 25th, I presented to students in the Foundation course Global Perspectives (Peace and Security) at Quest University in Squamish, BC at the request of their professor, Walter Dorn. The focus of the presentation was a case study focusing on the role of the UN in resolving conflict and reconstructing post-conflict societies. Discussion also centered on the crucial importance of good leadership given the political challenges currently facing the world. There were many questions about careers in the humanitarian field. I was very encouraged to find students who were genuinely interested in world events and who asked thoughtful and challenging questions. It’s hard to believe that 2016 is now nearing two months old; the year is shaping up to be as interesting and as stimulating as was 2015. Before I begin to focus on 2016 events, I would like to pay tribute to some of the highlights of 2015! There were many important and engaging moments. Here are three I would like to share with all of my readers. 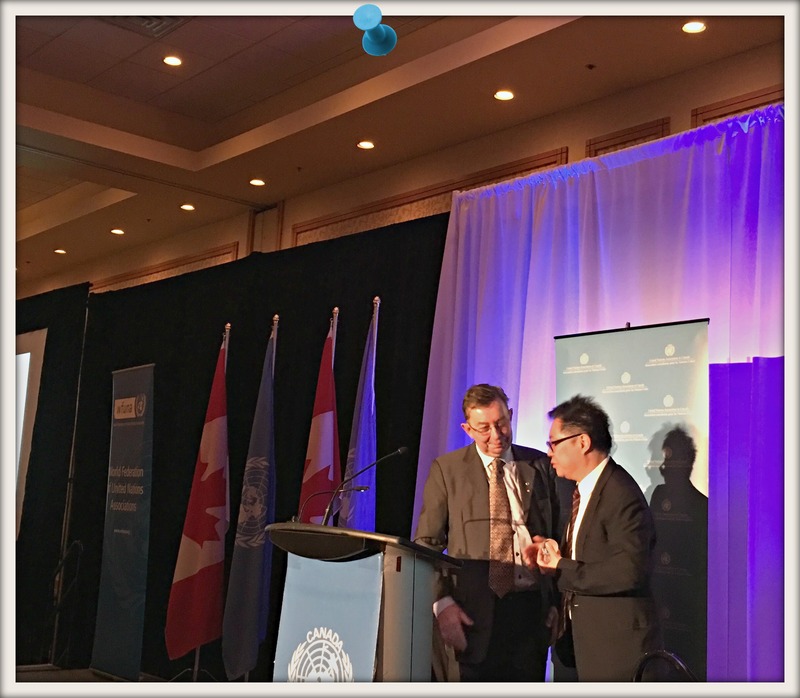 In November, as part of the World Federation of UN Associations (WFUNA) 2015 plenary meeting which took place in Vancouver, UNA Canada held a Global Citizens Gala Dinner as one of its fundraising events. The person honoured at the dinner was Terry Hui, President of Concord Pacific. The event was attended by the Vancouver business elite as well as many delegates from UN Associations from around the world. In May this year I spent two weeks, along with a group of three senior former United Nations military peacekeepers from Nepal, India and the United States, as an instructor in a training mission at the Bangladesh Institute of Peace Support Operations Training (BIPSOT). 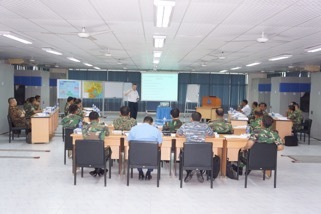 The training school is located 35 kilometres north of Dhaka and our task was to deliver a two-week training course covering all aspects of peacekeeping, to middle ranking military officers drawn from across Asia. Each of them would sooner or later become a contingent commander within a UN peacekeeping mission. UN peacekeeping today, like the UN in general, is under the permanent glare of the international media spotlight. Over recent years, most recently in the Central African Republic and the Democratic Republic of the Congo, UN peacekeepers have appeared in the media for all the wrong reasons. Often, though not always, allegations of peacekeeper wrongdoing are related to sexual exploitation and abuse of women or children. And yet, in a very imperfect world, UN peacekeepers carry out a seemingly impossible task always in conflict zones – a mission that no individual nation wants to undertake. It may be a cliché, but very often UN peacekeepers are the ‘thin blue line’ doing their best to prevent chaos in remote corners of the world. Because they belong to no single individual country, it is too easy for UN Peacekeepers to sometimes become the world’s political football – criticized by many and defended by few. These men and women, in order to have any chance to do their work properly, require training. This was what took my fellow instructors and me to Bangladesh this year. 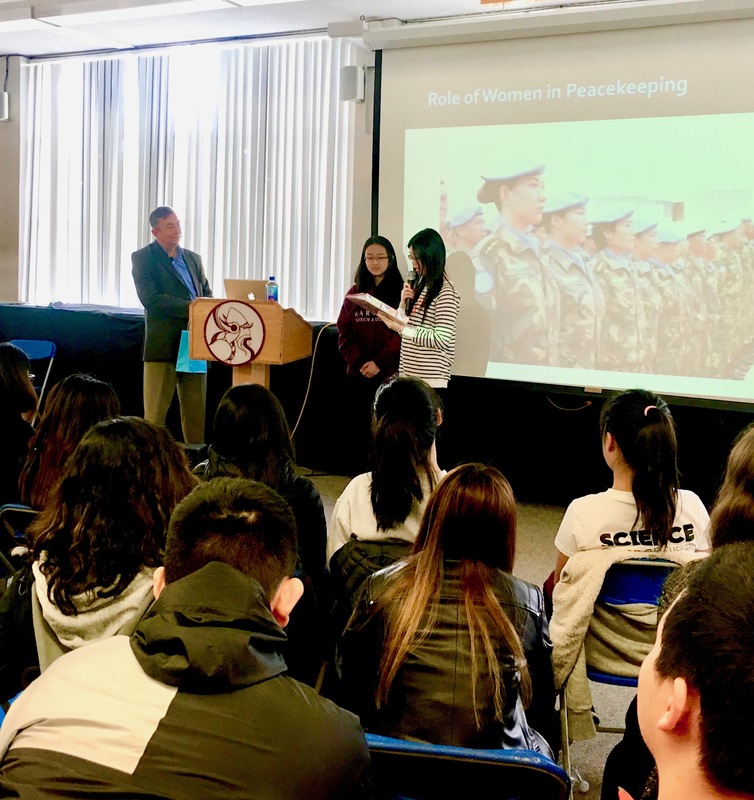 There were no women on this course, although there are increasing numbers of military women participating in UN peacekeeping missions around the world. Each of the 25 participants had been chosen by his national military leadership to be ready to command a national contingent of his compatriots as part of a larger UN peacekeeping mission anywhere in the world. A majority of the participants were from Bangladesh, currently the UN’s largest contributor of peacekeeping troops, but ten participants were drawn from other frequent UN troop contributing countries, including Indonesia, Malaysia, Mongolia, Nepal, the Philippines, Sri Lanka and Vietnam. The Peacekeeping Operations Contingent Commanders Course (PKOCC) is part of the Global Peace Operations Initiative (GPOI), a US-funded program that started in 2004 following that year’s G8 summit. The program’s goal is to strengthen the United Nations’ overall ability to effectively conduct peacekeeping operations, by providing training to peacekeepers from troop-contributing nations that request it. In 2004, when the program started, the goal was to have US forces train peacekeepers from other nations. But in subsequent phases of the program starting in 2009, instructors were drawn from former UN peacekeepers (mostly retired military or civilian officers) coming from many nations, including a small number of Canadians. The course closely follows a syllabus based on the UN’s own requirements and is designed and updated in co-operation with senior management from the UN Department of Peacekeeping Operations (DPKO). Specifically the GPOI aims to strengthen the professionalism of all UN peacekeepers. As well as buttressing their purely military skills, future leaders are trained in such skills as post-conflict peacebuilding, civil-military co-operation and humanitarian project support. Each of the instructors at BIPSOT 2015 PKOCC, one of whom was a former UN Force Commander, had a broad range of UN experience. 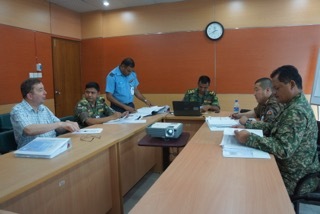 While each one was responsible for delivering specific areas of the syllabus, all instructors worked together to oversee the practical and fictional post-conflict scenario – known as Exercise Blue Commander – in which participants worked in teams to put into practice the concepts which they had learned in the formal presentations. As well as the exercise, large group discussions with the whole group dealing with such matters as gender Issues, child protection and human trafficking were also facilitated. Much of the material in the PKOCCC is strictly practical in nature, (e.g. the challenges of a multinational command, or the role and tasks of the military in a peacekeeping mission). This is critically important to a contingent commander about to lead his or her men into a conflict zone. The military aspects may be already familiar to an experienced Lieutenant-Colonel, but many other aspects of the course deal with issues that are sensitive, both politically and within the media. As such, those issues may be new to an aspiring contingent commander who has only worked within his own country. Each PKOCCC instructor at BIPSOT used his own experience to reiterate the importance of all UN staff strictly adhering to the Peacekeepers’ Code of Conduct. As a Communications/Public Information professional, I emphasized that the personal behaviour of individual UN staff within peacekeeping missions must always reflect the highest standard. It is essential that contingent commanders understand that public attitudes towards the UN depend entirely on the quality of the UN’s leadership at all levels, both military and civilian. Since the UN is a global organization, bad behavior in any one part of the organization will reflect negatively on the UN globally, as the international media broadcast the story around the world. At the same time, it is important to note that not every allegation of impropriety leveled at UN peacekeepers is based on fact since in some countries and in some media, the UN has become a useful political football. Another important area of knowledge for any military officer aspiring to leadership within a UN peacekeeping operation must include attitude and cultural awareness. Working within peacekeeping missions I have sometimes noted that civilian and military UN staff often have little or no experience of dealing with each other. Both sides, especially at the middle levels sometimes hesitate to cooperate. Yet it is precisely at this level that success within a peacekeeping mission – strengthening civil-military relations – depends on maximum cooperation. Training contingent commanders in being culturally aware of their civilian counterparts both within and outside the mission is a positive step toward removing barriers to cooperation at the mission level. 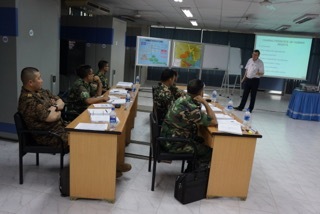 This year’s Contingent Commanders Course at BIPSOT was just one of many ongoing courses under the auspices of the Global Peace Operations Initiative. The military officers who benefit from these courses need all the hands-on training they can, so all of the instructors come from military or civilian peacekeeping backgrounds. Being the only civilian instructor on a course such as this can sometimes be challenging, and yet most of these future peacekeeping leaders express enthusiasm to collaborate with their civilian counterparts in a UN mission. I remain optimistic that it opens a new perspective about the broader work of the UN for young mid-career military officers. Peacekeeping is one of the UN’s many tasks around the world that has the highest public profile. We owe it to the young uniformed men and women who do this work – as well as to those civilians who will ultimately rely on them for security – to provide them to the best of our ability with the knowledge they need to fulfill the expectations the world holds. This article was written by Colin Robertson, a former Canadian diplomat. It originally appeared in the Globe and Mail on July 7, 2015. When the 1988 Nobel Peace Prize was awarded to UN peacekeepers, more than 80,000 past and present members of the Canadian Armed Forces could share in the honour. On Ottawa’s Sussex Drive, the statue –Reconciliation – commemorates peacekeeping. Global peacekeeping operations are more active than ever before. More than 130,000 blue berets are engaged in 16 operations, mostly in Africa and the Middle East. The UN budget for peacekeeping is just over $7 billion, less than half of 1 per cent of world military expenditures. Canada ranks ninth in financial contributors but there are currently only 115 Canadians engaged in UN peacekeeping. 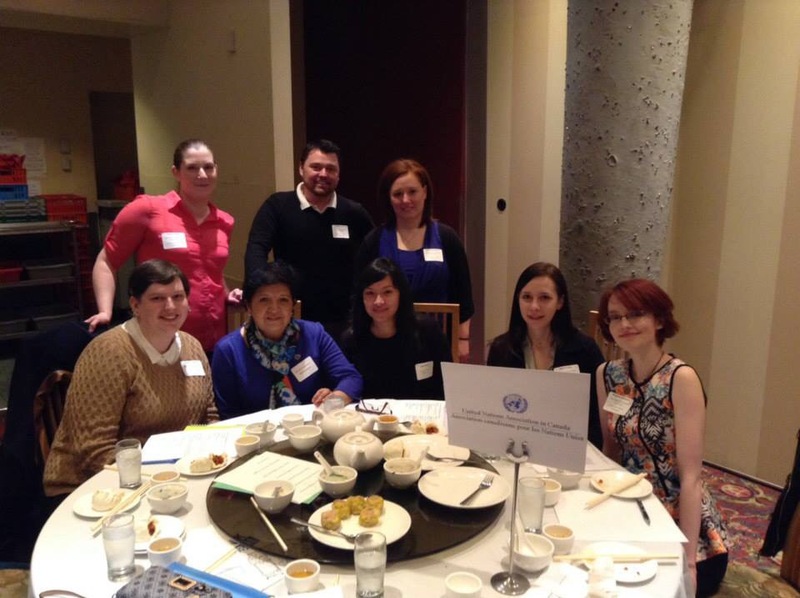 UN For All’s table at TGLL in 2014. George Somerwill of UN For All will be hosting a table at the upcoming Think Global Link Local networking breakfast. This will be the second annual “Think Global, Link Local 2015” networking event, a novel opportunity for students interested in the social justice sector to collaborate with expertise from the Vancouver area and beyond. A diverse range of local, national and international organizations will be hosting tables at the breakfast. Attendance will include professionals specializing in international development, human rights, poverty reduction, public policy, foreign relations, domestic politics, environmental and marine conversation, literacy, research, health, equality, LGBTQ rights, children’s rights, amongst several others. See the list of all organizations which will be represented at TGLL on UNAC-Vancouver’s website. 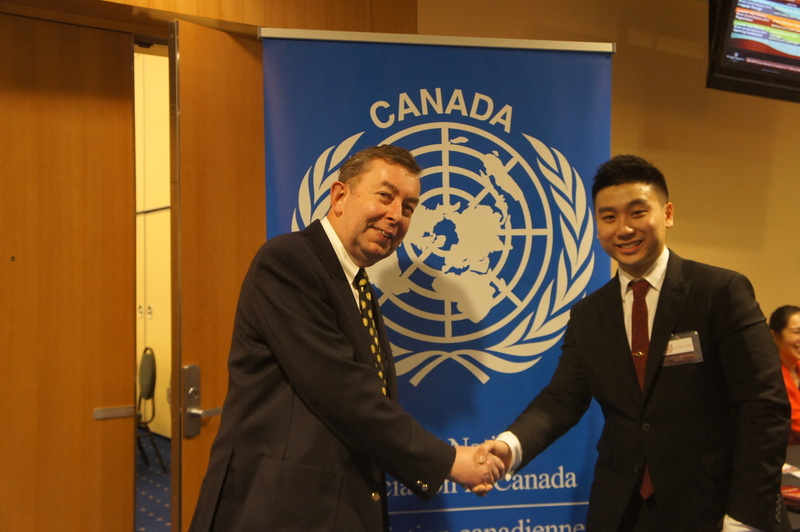 The United Nations Association of Canada Vancouver branch was proud to sponsor the recent Canadian High School Model United Nations (CAHSMUN) that was held this past weekend at the Sheraton Wall Centre in Vancouver. UNAC-Vancouver’s sponsorship went to support students who would not otherwise have been able to attend the conference due to financial need. Read more on UNAC Vancouver’s website. 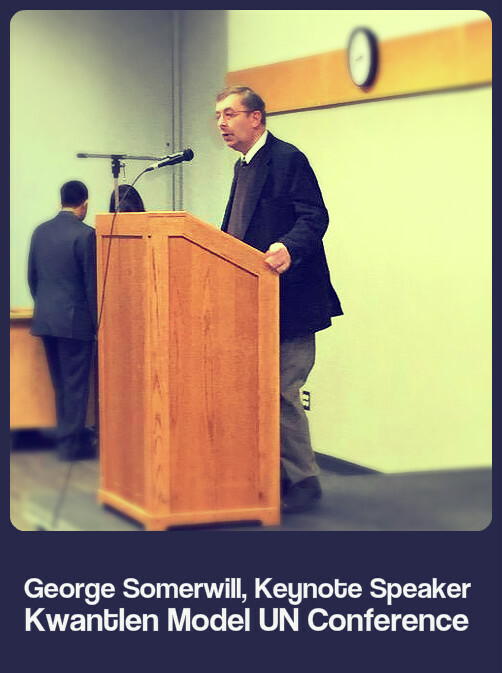 On Friday, December 5th, 2014, the largest Model UN conference south of the Fraser River opened with remarks from George Somerwill, at Kwantlen Polytechnic University in Surrey, BC. Here is an excerpt of the address entitled, The Shock of the Possible: Making the UN More Relevant in a Cruel World. “There are some people who say that the world is heading towards a confluence of disastrous events. I don’t agree with that statement, but if we as the human race don’t start to make some radical changes in the way in which we interact with each other and our planet…then we may well face some kind of worldwide disaster. What kinds of mechanisms are available to us that can make an impact? There are some general considerations we should think about. I believe these work for us as individuals, but they can and must also work for us at the national or international governmental or institutional level. Values/Goals: Justice, Equality (gender and racial, economic); Inclusivity, Discourse/Discuss. Listen: …to others, analyze what are they really saying. Watch out for political ‘spin’. Think about what they are saying and what action needs to be taken? How can you as an individual respond? Speak: This will be your first political act on an issue: outreach; clear and transparent; “this is what I/we think.” “This is what I/we will do.” How you follow up your speaking is critical. Act: Your choice of action is critical. Your second political act. A plan of action demonstrating your ideals or goals.